Poppy is thrilled to be back doing the one thing she loves – riding horses at Starlight stables – especially when her aunt and uncle make all her dreams come true with a gift of her very own horse. But there's a catch . . . Poppy must look after the new scholarship girls. Will the bold and troublesome Milly and shy, sensible Katie be the pony-mad friends she's always hoped for? 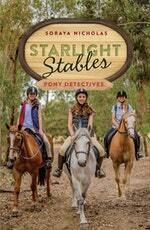 Love Starlight Stables: Pony Detectives (Book 1)? Subscribe to Read More to find out about similar books.